Vitreous disorders are various conditions that affect the gel-like substance (vitreous) inside the eye that helps the eye keep its round shape. Some of these conditions create only minor vision disturbances while others may be a sign of more serious eye problems. The following are some common vitreous disorders. The vitreous has millions of tiny fibers running through it. These attach to the light-sensitive layer of tissue on the back of the eye, the retina. The vitreous slowly shrinks as you grow older, which causes the fibers to tug on the surface of the retina. This does not usually cause any damage the retina because the fibers break. 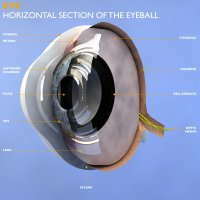 However, it does allow the vitreous to separate from the retina. The main symptom of vitreous detachment is floaters in your field of vision. These appear as floating specks or “cobwebs” that dart out of the way when you try to look at them. Sometimes, you may also notice a small but sudden increase in the number of floaters accompanied by flashes of light in your side vision (i.e., peripheral vision). Other than floaters, vitreous detachment does not usually cause any vision problems. Occasionally, though, when the fibers pull on the retina, they may create a hole in the macula or cause the retina to detach. Both of these can damage your vision and should be treated promptly. If you suffer from vitreomacular adhesion, your ophthalmologist may suggest waiting and monitoring the condition to determine whether symptoms get worse. If the symptoms get worse, medication or surgical intervention may become necessary to address the problem. Uveitis is a type of inflammatory disease that leads to swelling and destruction of the tissues of the eye. This can affect many parts of the eye, including the vitreous, retina, optic nerve, lens and the uvea. This condition can cause reduced vision or blindness, depending on the part of the eye that is affected. Inflammation of the vitreous, known as intermediate uveitis, has been linked to several other health conditions, such as multiple sclerosis and sarcoidosis. If you experience a sudden change in vision, including an increase in flashes of light in your side vision or in the number of floaters, have your eyes examined by your ophthalmologist right away, as this may be a sign of a serious vision problem. If you notice gradual changes in your vision or are overdue for your routine eye exam, contact us to schedule an appointment today. Your eye health may depend on it.